Turkey conducted a successful test of its Bayraktar drone using an MAM-L smart ammunition projectile on April 29. ANKARA, Turkey — After its southern cities bordering Syria came under increasing mortar attacks from the Islamic State outposts across the border, Turkey's military and procurement officials have accelerated the country's two independent armed drone programs. Some of Turkey's cities on the Syrian border, most notably Kilis, have been hit by a series of rocket attacks by the Islamic State, also known as ISIS or ISIL, from Syria since mid-January. Several dozen people have been killed or injured. The Turkish army has been responding with its howitzers deployed on the Syrian border but procurement sources say Turkey needed more efficient ways to counter the Islamic State attacks. Ismail Demir, Turkey's chief procurement official, said: "The best method is to monitor the region [under ISIS' control] and mobile threats, and to have capabilities to hit the threat at its origin ... like armed drones." Turkey has accelerated its armed drone programs in the wake of cross-border Islamic State attacks. On April 29 Turkey successfully tested an armed drone, the Bayraktar, which hit a target at the Konya fire test field in central Anatolia from a distance of eight kilometers. The Bayraktar uses the MAM-L and MAM-C, two mini smart ammunitions developed and produced by the state-controlled missile maker Roketsan. Roketsan's mini systems weigh 22.5 kilograms including a 10-kilogram warhead. Now the local industry is developing BSI-101, a signals intelligence (SIGINT) system, for the Bayraktar in order to end Turkey's dependence on U.S.-made SIGINT systems for drones. In its first fully automatic flight test in 2014, the Bayraktar, developed by the Kale-Baykar group, flew for three hours at an altitude of 18,750 feet. In a later test, the drone reached an altitude of 27,000 feet and flew for 6.5 hours. And in a final round of tests, the drone flew at an altitude of 18,000 feet for 24.5 hours. The Bayraktar features indigenous software and electronic systems, according to the producer. Its maximum takeoff payload is 650 kilograms. 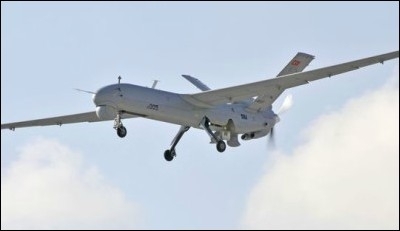 Kale-Baykar boasts that, under the Bayraktar program, the consortium developed various critical systems in drone technology, including a flight control with three backup systems, inertial navigation and GPS systems, static pilot system, power control unit, a lithium-based smart battery, aerial data recording computer, video-link system, tail camera, ground control station and command-and-control software. After the Bayraktar's armed test flight, Demir tweeted: "We are so proud ... with tears in our eyes." Turkey is developing an armed version of its Anka long-endurance drone. Meanwhile, Turkey also is speeding up efforts to develop an armed version of the Anka, a medium-altitude, long-endurance drone from Turkish Aerospace Industries (TAI). The Anka can fly at an altitude of 30,000 feet for 24 hours. It will be used for reconnaissance and surveillance missions. The aircraft can carry up to 200 kilograms of payload. TAI is developing an armed version of the Anka. To boost that effort, Turkey's procurement agency, the Undersecretariat for Defense Industries (SSM) in April launched a competition for the indigenous development of several sub-systems for drones, including warfare systems. In 2014, military and defense officials moved ahead with a plan to add satellite communications capabilities to the Anka, while also bringing together a task force that would design and develop an indigenous engine for the drone. That drone, the Anka S, will be delivered by 2017. Meanwhile, to help Turkey counter the Islamic State's attacks, the US-led coalition continued early in May to fire on ISIS targets in Syria's north together with Turkish artillery. Four MQ-1 drones took off from the Incirlik Air Base in southern Turkey to strike ISIS targets. They destroyed five weapon pits belonging and took out multiple rocket launchers and gun positions. The Turkish government recently asked the US to use its drones equipped with Hellfire missiles more effectively against Islamic State targets. It also demanded the deployment of High Mobility Artillery Rocket System (HIMARS) rocket launchers at Turkey's border with Syria. A Turkish military official said that the aim is to push Islamic State fighters southward, which would leave Turkey's border cities, including Kilis, out of battery ranges. There are four Predators and 12 A-10 bomber aircraft at Incirlik Air Base.